I am what I eat, but is that all that I am? I'm passionate about many things, consumed by some and totally repulsed by others. I'm intense and commit totally or not at all. My Dad - first coach and cheerleader - would watch my antics, shake his heads and murmur to me and an invisible asssembly, "Thank God, you're not a missionary!" I garden with the same intensity as I cook and that's how it happened that I was up to my knees in mulch on a wet, chilly Oregon day last week. It wasn't the bitter cold of winter, but rather a creeping, damp that chills the bone and afflicts serious gardeners wherever they may be. Soup and stew help ward it off, but there was no time to make either. I culled from memory a recipe - a golden oldie - that would provide warmth and comfort in a bit less than an hour. I'd forgotten how satisfying pork cooked in this manner can be. You'll need some bacon, pork chops, cabbage, wine and cream to pull it off. Then let imagination carry you to a French farmhouse kitchen with a roaring fire and bottle of vin rouge on the table. Grab a glass and pour. 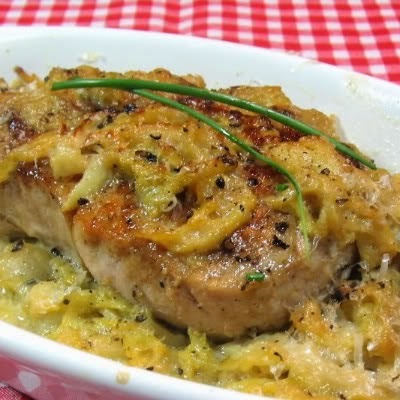 The recipe comes from the mountainous Auvergne region of France which is famous for rustic pork dishes such as this one. Here's the recipe. 1) Heat oil in a large, deep skillet until it shimmers. Add bacon and saute until light golden brown, about 3 minutes. Transfer bacon pices to paper toweling to drain. 2) Season both sides of pork chops with salt and pepper. Saute until a deep golden brown on each side, about 5 minutes per side. Transfer to a plate and tent with foil to keep warm. 3) Add sliced cabbage to skillet and cook until wilted, about 3 minutes. Stir in white wine and cream. Season to taste with salt and pepper. Return pork chops and bacon to pan and simmer, partially covered, until cabbage is tender, about 10 to 15 minutes. 4) Preheat oven to 350 degrees. Transfer mixture to a greased ovenproof casserole or individual gratinee dishes. Spoon some cabbage over top of pork chops. Sprinkle with Parmesan cheese and melted butter. Bake, uncovered, until top is lightly brown, about 20 minutes. Yield: 4 servings. Nice recipe, and ready in under an hour? Sign me up. My mouth was watering as I read the recipe. I loved a creamed cabbage anyway; but toss in some pork and wine, now we're talking! YUMMERS! Mary, what a gorgeous dish and I'm not wild about cabbage but I'm crazy for pork. You know I love anything French. This looks great -- I have pork thawed -- with cabbage from the market, this will be dinner! Mary you should be cooking for a five star restaurant. This looks like it could be on the menu of the very best restaurants in the country. Delicious! Mmmm, this looks so good. I can almost smell it cooking. I'm obsessed with everything French right now so have to try this. This does look warming and satisfying, delish! Mary this sounds and looks out of this world. Last week when I cooked pork I was worried I might grow a tail can't wait to try this. I'm there! This looks and sounds amazing! Thanks for sharing this. Oh my, Mary. This could become my favorite dish just from your description. Love your way with words! It looks fabulous - a perfect meal for those cold days in Oregon. Can I come and live in your kitchen? Got the kitchen window open? Your neighbors must be very jealous of what goes on in your kitchen. This sounds so perfect, it is going on the top of my list to try. Thank you, thank you. I know we will love this!! I would totally commit to this. Oh my goodness, this recipe sounds tantalizing and more than able to warm a body up on a cool day. Perfect comfort food, Mary, and a fabulous photo! Oh Mary- that looks delicious. Pork and cabbage are such a pair. I havent really made a lot of French dishes. This oe sounds like a good one. That looks and sounds AMAZING!!! I would like to stick a fork in that photo and be able to taste it... YUM! Fifi, I'm so glad you are back. This dish is not hard to make. I hope you'll try it. Well then i am probably one big piece of chocolate! Nice recipe and I have visited that French region...beautiful! This dish looks fantastic! I am not a pork fan, but we all love cabbage dishes (hubby is French, after all). The flavors in this sound wonderful and I'll bet this was so flavorful and delicious. Maybe I'll ask hubby to make it? That sounds like a great way to serve cabbage! That looks great. I think I may even make that! Whoa.. This looks phenomenal.. and Im not that crazy about pork chops.. M'honey is though.. and I could be with the right recipe.. This looks like "the one!" Mary, I prepared this for dinner tonight, and it was delicious. I did use a pork tenderloin instead of chops, but we all loved it.